Social media seems to be everywhere you look. TV commercials now include hashtags, you can order a pizza with a tweet and Facebook’s fastest growing demographic is people 65 and older. Needless to say, social media is changing the world and nearly everyone is on board. Marketers always go where the customers are, so it is not a surprise that social media marketing is on the rise. Unfortunately, far too many businesses are ramping up their social media efforts without an understanding of what troubles they may face. All of these can be overcome, but it is important to understand some of the brutally honest truths about social media marketing. When you are first getting started, social media can be down-right depressing. You post and post and post, yet no one seems to care. But ask yourself this, why would they? Far too many businesses expect immediate results when they begin marketing on social media. Howecer, building a community, which should be your ultimate goal, takes time and requires trust. How do you build trust? By sharing valuable content, participating in discussions and most importantly, not expecting anything in return. Over time your business will build credibility and this will lead to higher engagement, more followers/likes and eventually, more leads and sales. How long will it take? This is a tough question to answer, but it will certainly be longer than most businesses expect. Understanding that social media isn’t a fast track to success is important because it allows you to focus on what is. Build a loyal community and we guarantee the results will be beyond your wildest expectations. Organic reach for Facebook Business Pages is all but a thing of the past. The days of posting an update and it being shown to all of your fans are long gone. Want to know the crazy thing? You should be thrilled. Though organic reach across most social networks is declining by the second, targeted paid ads are becoming more and more powerful by the day. Whether you are planning to use Facebook, Twitter or another network, it is important to understand that you will need to spend money to effectively market your business. The good news is you will still be paying significantly less than you would for traditional marketing. What pain-point(s) does my product/service solve for them? What form of content will resonate best with them? It might seem simple, but all great marketing starts with answering these questions. Knowing who your ideal customer is, why they would buy from you and how to effectively connect with them is crucial. Once you have answered these questions, you will find it much easier to create a social media strategy that will work for your business. Every business has a unique audience, including yours, so focus on serving them, not copying what everyone else is doing. Every business that starts posting on social media has dreams of that “perfect” tweet or Facebook update that goes viral. Unfortunately, you will probably never have a posts go viral. Once you really think about it though, it really isn’t that unfortunate after all. Social media is about community. A post going viral might briefly expose your brand to a larger audience, but ultimately your community is where the majority of the value is. Focus less on going viral and more on high engagement from your community, regardless how big or small it is. The number of followers you have is just that, a number. Though it can be a telling metric, more followers should not be your main goal. The reason is simple, follower numbers can be manipulated. You can buy followers. You can follow and unfollow a lot of people. The list seems to go on and on. So what really matters? Engagement! Shift your thinking from gaining followers to increasing engagement. Engagement can be likes, shares, link clicks, direct conversations, etc. When your engagement grows, so will your credibility and reach. 77% of marketers reported that they planned to increase content production this year. What does this mean for your business? You need to invest in creating original content. Original content acts as a magnet, attracting new leads to your business and positioning your business as an industry expert. This content can come in the form of a blog, videos or webinars to name a few. Again, it is important to understand what will resonate best with your audience and what type of content will allow your business to shine. Once you decide which type(s) of content you want to create, you must next decide if you want to create it in-house and/or outsource it. Both options have their advantages depending on your needs and we recommend considering a little of both. The bottom-line is this, if your business isn’t creating original content, you are at a significant disadvantage. When it comes to social media there is one thing all of the experts agree on, businesses can’t afford to not participate. Sujan Patel’s analogy of driving at night without headlights perfectly captures the importance of social media. Though your business could theoretically survive without social media, is your goal to survive or to thrive? Without a social media presence, the best your business can hope for is survival. However, with a commitment to marketing via social media, your business will have an amazing opportunity to compete with even the largest companies and hopefully thrive because of it. 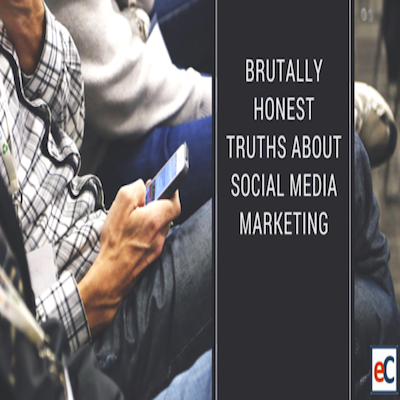 Did we forget any honest truths about social media marketing? If so, let us know if the comment section below! If you enjoyed this post, please share it with your friends.